A little while back, a reader expressed interest in having me test paleo-friendly power bar recipes. She had tried one recipe and found it too salty, sticky, and just no good. I'm always up for a challenge, and I know people who could really use some homemade power bars to get them through the day. So, I've lined up a handful of promising recipes to test and provide my thoughts and feedback on! 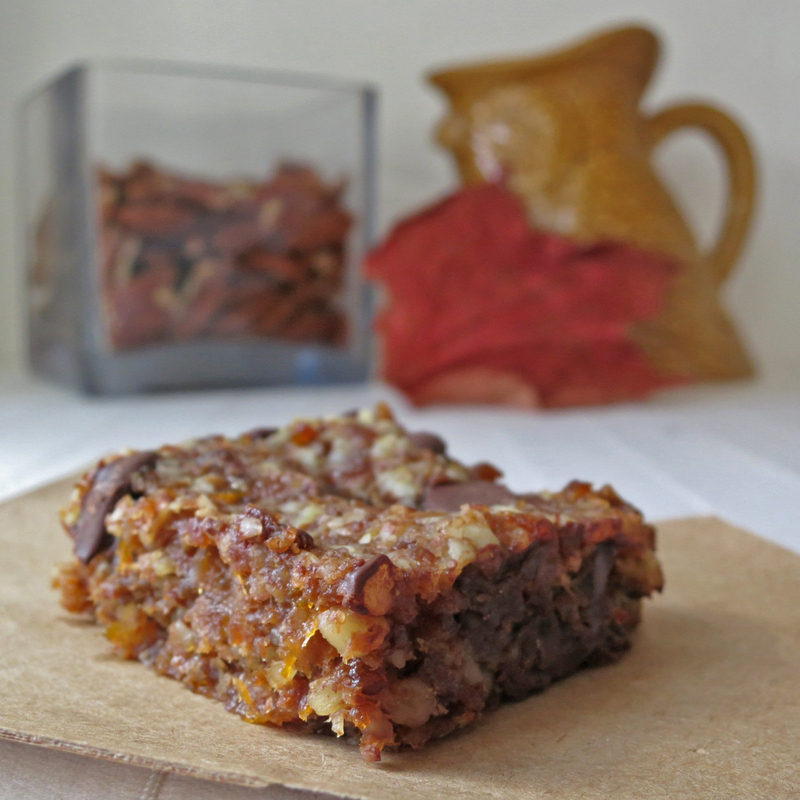 This is the first of a set of energy bar recipes I intend to test and post. I hope these help many of you navigate and evaluate the diverse set of power bar options that exist. There are some criteria I am looking for in an ideal energy bar recipe, based on a combination of my preferences and those of my reader: not too salty, not too sweet, not too sticky, sturdy/can be packed in a bag and eaten later without crumbling, no grains (paleo), no eggs or butter (my preference), calorie-dense, and no protein powders. As I scout out and evaluate the recipes, these criteria will be my prime influencers of recipe selection and criticism. It wasn't long ago that I blew out a mini food-processor making honey-almond-date treats. I've gone without one since then. But with the goal of testing energy bar recipes, and all of them calling for a processor, I buckled. I knew a mini processor wouldn't do the trick, but I wasn't about to shell out big bucks for a top shelf tool, either -- because what if even THAT was no match for a bowl full of dates? So I ran to the nearest Walgreens and grabbed the cheapest large processor-blender on the shelf: a Ninja Food and Drink Maker. So far I've been pleased. After a few more weeks of chopping dates and other dried fruit, though, we'll really know what it's made of. I'm sure it shudders in my pantry. The enticing combination of organic turkish apricots and toasted pecans hand-tossed with chocolate chips convinced me to start with the recipe below. I mixed it up and popped it into the oven. It really starts to smell great after 20 minutes: the pecans start roasting, vanilla is in the air, chocolate is melting, and apricot sugars are bubbling. Mmmm. 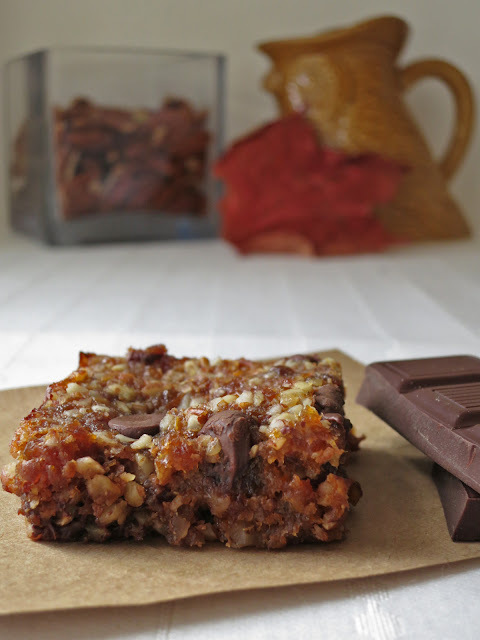 The finished bar is moist but not too sticky, sweet and satisfying. However, they are not super sturdy, and regular chocolate chips made them a little too sweet. But overall, a good starting point! Makes about 16 squares in an 8"x8" pan. Adapted via Elana's Pantry to be vegan and paleo. Process apricots and pecans until finely chopped. Mix by hand or process until thoroughly mixed: salt, flaxseed and water mixture, and vanilla. Stir in chocolate by hand. Line an 8"x8" pan with parchment paper and press the batter into the ban. Bake for 20 to 25 minutes. Cool for 15 minutes before cutting. I think they turned out really good. They do remind me of the honey bar at the co op with the seeds and nuts in them. I used my demarle 8 x 8 pan so I didn't need paper. If you like to bake a lot, www.demarleathome.com is a very cool spun glass cookware that needs no greasing or lining. Everything pops out clean. 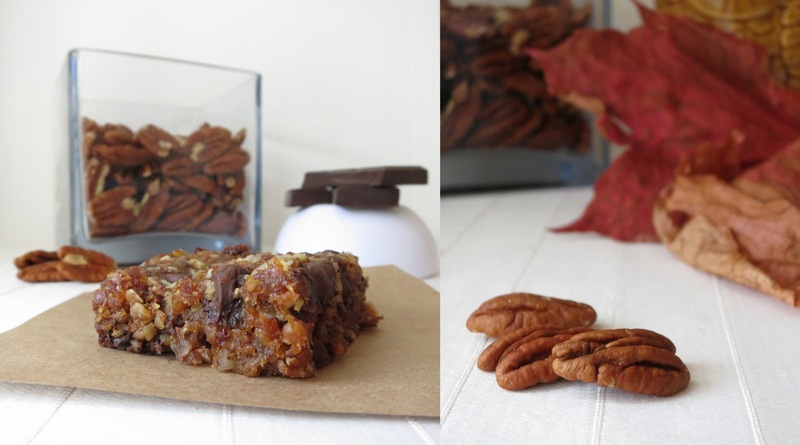 So A+ on the Apricot pecan bars! Awesome! So glad these turned out for you! As someone who is not so concerned about sugar as long as it is can sugar not HFCS I have some home made apricot jelly handy. Do you think this might work in place of dried apricots if I reduce to 1/2 cup and leave out the moistened flax seed? Good question! The apricots do provide a lot of "heft" in the bars, so if your home made jam is quite full of fruits, then it might work. If you want to give it a try, I'd suggest mixing everything else together first, and then adding the jam or jelly until you feel like you've reached a sturdy enough consistency. You may need to add more nuts or grind them more finely to give the bars a firm body. Best of luck if you choose to try it!